Low-alcohol pinot: same as the Old Boss? Many of you may know about the ongoing raging debates about alcohol levels in California pinot noir, with the latest conflagration resulting from Adam Lee’s (Siduri Wines) “switcheroo” pulled on Rajat Parr, a well-known sommelier who has set a policy of not offering wines with an alcohol level above 14% at one of his restaurants, RN74 – a restaurant that pays hommage to Burgundy. Longtime pinot fans probably also know that this debate is not new, and one of the primary figures in pinot debates of yesteryear was Joe Davis, whose Arcadian pinot noirs are the primary subject of my post today. Perhaps the lower level of buzz around Arcadian wines is a result of them having been around for a long time – a victim of the “been there, done that” mentality of wine geeks always searching for the hot new thing. Perhaps it’s because the scores from Wine Spectator and Robert Parker have been relatively low, and in some cases, the wines not reviewed at all in recent years. Or, maybe Joe Davis ruffled too many feathers back in the day. 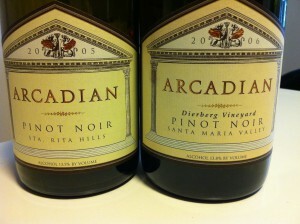 In any case, the pinot noirs of Arcadian have impressed me on the few occasions that I’ve had them. My first experience with Arcadian was when a 2001 Arcadian Garys’ pinot was served at a double blind tasting I attended, in early 2010. The tasters were accomplished and knowledgeable wine enthusiasts, with some industry pros among them. About a dozen wines of very high caliber (Pierre Peters champagnes, Clos de la Pepiere Muscadets, Marcel Lapierre Morgon, a Domain St. Martin Chambertin Clos de Beze grand cru) were tasted, and most of us felt that the Arcadian was the wine of the night. Just as interestingly, many of the group guessed that it was burgundy, and good burgundy at that – the words grand cru were definitely bandied about. I did recognize the wine as being from California, but I agreed that it was on par with very high-level burgundy for my palate. My next two experiences drinking Arcadian wines demonstrated another reason for why I’m so high on this winery – the wines can be found at good value prices. A 2005 Arcadian Santa Rita Hills pinot was very much like an excellent bourgogne or even a solid village burgundy – it didn’t show as much sweet fruit as the ’01 Garys’ single vineyard bottling, leaning more toward the restrained, slightly stemmy herbal side of things, but at under $30 I was happy with the freshness and lightness of this pinot. With time, some of the bitterness in the tannin should resolve. The 2006 Arcadian Dierberg Vineyard pinot (which I found for $38, compare to single-vineyard bottlings from many top producers at $50-60) was more obviously California in character than the others, showing appealing aromatic strawberry notes that I have found to be a trademark of pinot noirs from the Santa Maria valley. I have had a lot of overripe pinot noirs from Santa Barbara, but Joe Davis is known for picking earlier in the vineyards than most other producers using fruit from the same sites, and the result is that the wines retain a nice balance and have the structure to age well. Indeed, because of the longer-aging style of their wines Arcadian holds its wines longer than most California wineries before releasing them. Their current releases are from the 2005 and 2006 vintages, where you’ll find 2008 pinots as the current release from most producers. “If you want to drink quintessential Arcadian look for the 2001 and 2005 vintages both are classical in my estimation and all are great wines.